Description - The steamship that the Heinrich and Johanna Lüdtke family traveled aboard to America. Manifests - Passenger lists showing the Heinrich Lüdtke family embarking from Hamburg on March 19, 1882 and arriving in New York on April 7, 1882. Description - George Just traveled from Bremen to New York aboard this Norddeutscher Lloyd steamship in 1884. Description - Christoph and Barbara Just and their son Friedrich sailed from Bremen aboard the SS Havel and arrived in New York on April 4, 1895. Description - The steamship that brought the Peter and Christina Meidinger family from Bremen, Germany to New York in 1903. Manifest - Passenger list showing the Peter Meidinger family and Barbara Gramm arriving April 1, 1903 at the Port of New York. Description - In April 1882, William and Marie Rieck and their 7-month-old daughter, Hermine, boarded this steamship in Stettin, Germany for their voyage to New York. Manifest - Passenger list showing Wilhelm, Marie, Hermine and Carl Rieck arriving together on May 8, 1882. Description - Christian and Caroline Rieck together with his three children and two of her children by a former marriage sailed from Hamburg to America aboard this steamship arriving in New York on June 22, 1883. Manifests - Passenger lists showing Christian Rieck, Caroline Müller and their children departing Hamburg June 3 and arriving in New York June 22, 1883. Description - The steamship that carried the Carl and Wilhelmine Maass family from Cuxhaven, Germany to the USA. Description - The Ludwig and Catharina Rudolf family sailed from Bremen to New York aboard this 2-year-old steamship during October 1884. It was previously thought that the Heinrich Lüdtke family sailed aboard the SS Allemania that was built in 1865. According to Ted Finch (Mariners-L mailing list owner), this ship was renamed the Oxenholme in 1880, so could not have sailed as the Allemania in 1882. Apparently the Lüdtkes came aboard a new ship also called the SS Allemania. To my knowledge, no known photograph of this second ship has been located. The second SS Allemania was built in 1881 by Dobie & Co, Glasgow (engines by J. Howden & Co, Glasgow) for the Hamburg-American Line. She had a gross weight of 1846 tons and was 375.8 ft long with a beam of 34.4 ft. The iron-hulled steamship had one funnel, two masts, a single screw and a speed of 11 knots. She had accommodations for 30 first class and 300 third class passengers. She was launched for the West Indies service on May 27, 1881 but three months later on August 21 she began her maiden voyage between Hamburg, Havre, and New York. On March 19, 1882 Heinrich and Johanna (Maass) Lüdtke and their three girls boarded the Allemania in Hamburg and arrived in New York on April 7, 1882. Her fifth and last Hamburg - New York sailing commenced on October 22, 1882 after which she was transferred to the West Indies route. 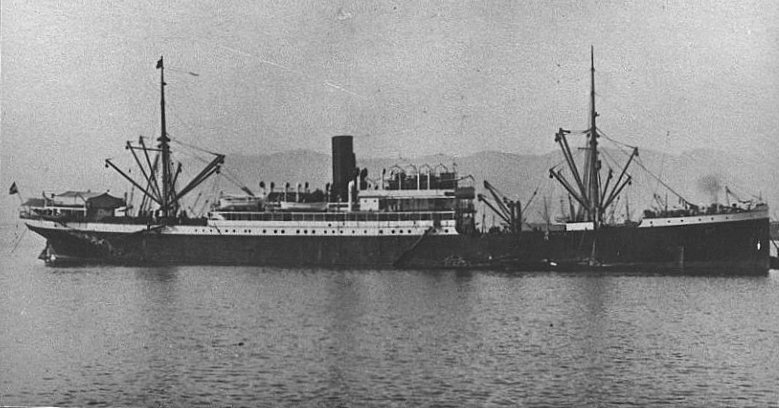 In 1904 she was sold to Japan and was renamed MIKADO MARU. Eventually she wrecked at Hokkashamoru, Japan on February 13, 1937. The SS Elbe was an iron-hulled steamship built by John Elder & Co, Glasgow, for Norddeutscher Lloyd, and launched on April 2, 1881. The ship was 432 ft in length, 45 ft in breadth and had a gross weight of 4,510 tons. She had a straight bow, two funnels, and four masts. Powered by double-expansion engines, the single screw propelled the steamer at a service speed of 16 knots. The Elbe was Norddeutscher Lloyd's first express steamer and could sail from England to New York in just over 8 days. However, she proved to be uneconomical because of her high consumption of coal and her small cargo capacity. She had accommodations for 179 passengers in 1st class, 142 in 2nd class, and 796 in steerage and was the line's first vessel with first class amidships instead of aft. Information about the conditions on this ship can be found on the German Emigrant Database website. Her maiden voyage was June 26, 1881 from Bremen to Southampton and New York. In 1883 she was outfitted with electric lights. The next year George Just boarded the SS Elbe in Bremen, Germany and arrived at the Port of New York on September 27, 1884. The Elbe made many more trips over the next 10 years, including three voyages to Australia, but on January 30, 1895, she collided with the British coal collier "Craithie" about 30 miles west of Ijmuiden, Netherlands. Within 20 minutes she sank to the bottom taking 332 of the 352 passengers on board with her. The SS Havel was built for the Norddeutscher Lloyd line by AG Vulcan, Stettin in 1890. The 6,875 gross ton ship had a length of 463 ft, a beam of 51.9 ft. The two-funnel, three-mast ship was powered by a single screw and sailed at a speed of 18 knots. There were accommodations for 244 first-class, 122 second-class and 460 third-class passengers. Launched on August 30, 1890, she sailed from Bremen on her maiden voyage to Southampton and New York on February 5, 1891. In the spring of 1895, Christoph and Barbara Just and their son Friedrich traveled to Bremen where they boarded the Havel for their voyage to America. They arrived at the Port of New York on April the 4th. After her last voyage on this route on April 19, 1898 the SS Havel was sold to Spain, where she was converted to an armed cruiser and renamed the "Meteoro". In 1899 she went to Compania Transatlantica Espanola and was renamed "Alfonso XII". Between October 30, 1916 and February 7, 1918 she made 9 round voyages from Bilbao to Coruna, Vigo, Havana, and New York. In 1926 she was scrapped in Italy. Source: Ted Finch who cited North Atlantic Seaway by N.R.P.Bonsor, vol.2, p.555. The SS Kaiser Wilhelm der Grosse was built by the A.G. Vulkan yard in Stettin, Pomerania for the Norddeutscher Lloyd Co. and was launched on May 4, 1897. At the time she was the largest ship afloat, 648 ft in length, 66 ft in breadth with a gross weight of 14,349 tons. The four-funnel, two-mast steamship was propelled by twin screws driven by two triple-expansion engines (28,000 horsepower) that consumed 560 tons of coal a day. At a service speed of 22.5 knots, she was the fastest ship in the world until 1900. She originally accommodated 332 in 1st class, 343 in 2nd class, 1,074 in steerage but in 1901 the configuration was changed to 400 in 1st class, 350 in 2nd class, and 800 in steerage. Because the ship was top-heavy, she was known to her regular passengers as "Rolling Billy". Information about the conditions on this ship and a photo of emigrants boarding the ship about the year 1898 can be found on the German Emigrant Database website. On March 24, 1903, Peter and Christina Meidinger accompanied by their eight children and Christina's mother, Barbara Gramm, boarded the SS Kaiser Wilhelm der Grosse in Bremen, Germany for their voyage to New York. Eleven years later on March 18, 1914 she made her final voyage as a passenger ship between the same two ports. In August 1914, she was converted to a merchant cruiser in Bremerhaven. She sank three ships before stopping to refuel off Rio de Oro, Spanish West Africa. On August 26, 1914, she was overtaken by the British cruiser HMS Highflyer and after a 90-minute battle, the Kaiser Wilhelm der Grosse ran out of ammunition and, although not badly damaged, she was scuttled by her crew. The steamship Kätie was built by Alexander Stephen & Sons, Glasgow, for Stettiner Lloyd, a steamship company founded in 1880 to provide service from Stettin to New York by way of Scandinavian ports. She had a gross weight of 2,796 tons and was 320.8 ft long and 40.5 ft in breadth. The iron-hulled ship had a straight stem, 1 funnel, and 2 masts. Her service speed of 10 knots was reached with screw propulsion powered by compound engines. She had accommodations for 25 passengers in 1st class, 600 in steerage and a crew of 45. The Kätie was launched on 4 November 1880 and nine days later began her maiden voyage from Glasgow to New York. Her second voyage was in April 1881 from Stettin to Copenhagen, Christiansand, Newcastle, and New York. She made four roundtrip voyages in 1881 and three roundtrip voyages in 1882. On one of those trips, Wilhelm and Marie (Schulz) Rieck and their 7-month-old daughter, Hermine, traveled from Stettin to New York, arriving on 8 May 1882. In April 1886, the Kätie commenced her 26th and last sailing between Stettin, Gothenburg and New York. Stettiner Lloyd then went into liquidation, and in October 1886, she was sold at auction. For three years she was part of the Furness Line and then in 1890, she went to J & M. Gunn & Co, Glasgow and was renamed DUNKELD. On 27 March 1895 while on passage from Cardiff to Buenos Aires with a cargo of coal, she struck a submerged derelict off Lobos Island, Argentina and sank. The SS Oldenburg was built in 1890 by the Fairfield Shipbuilding and Engineering Co. of Glasgow, Scotland for the Norddeutscher Lloyd Co. of Germany. She was 415 feet long, 48 feet wide, and 31.3 feet in depth, and had a registered gross weight of 5006 tons. The steamer had a speed of 13 knots and was powered by a single screw. She had triple expansion engines with cylinder diameters of 31, 52, and 83 inches and a 54 inch stroke that delivered 3600 horse power. The ship had four decks, two masts and one funnel and was equipped with electric lights. She was designed to carry 49 first-class, 38 second-class, and 1900 third-class passengers. The Oldenburg was launched on February 11, 1891 and made her maiden voyage from Bremen to Montevideo and Buenos Aires on June 11, 1891. Her first voyage to Baltimore was on February 18, 1892. Three years later, on May 16, 1895, she left Bremen with eight very special passengers, the Julius Maass family. According to the manifest, Capt. R. Heintze was at the helm. After making many more round trips between Bremen and New York, Baltimore, and ports in South America, she was sold to Turkey in 1911 and renamed the Ak-Deniz. In 1923 she was scrapped. Other sister ships in this class were the Darmstadt, the Gera, the Karlsruhe, the Stuttgart, and the Weimar. Source: Smith, Eugene W. 1978. Passenger Ships of the World - Past and Present. The "Polynesia" was built by C.Mitchell & Co.,Walker-on-Tyne in 1881 for the Carr Line of Hamburg (engines by Wallsend Slipway Co.). She was a 2196 gross ton vessel, length 298.7 ft x beam 36 ft, one funnel, two (extremely tall) masts rigged for three jib sails, iron construction, single screw and a speed of 10 knots. There were accommodations for 950 3rd-class passengers only. She was launched on 5 Nov 1881 and began her maiden voyage on 27 Dec 1881 when she left Hamburg for New York. Service on this route continued for the next seven plus years. On 3 June 1883 Christian Rieck and his three children and Caroline Müller and her two children boarded the Polynesia in Hamburg to begin their trip to America. The ship arrived in the port of New York on June 22, 1883. In May 1888, the Carr Line vessels were taken over by Hamburg America Line and continued on the same service. On 27 Apr 1889 she commenced sailings from Stettin to New York until, after 19 round voyages, she started her last sailing from Stettin on 29 May 1892 and then resumed the Hamburg - New York service. On 11 Aug 1894 she started her last trip from Hamburg to Baltimore and on 30 Jul 1903 was sold to a British company. Later the same year she went back to the German flag and in 1904 was sold to Italy. She was sunk by an old wartime mine near Reggio, Italy on 28 Aug 1921. The SS Rhaetia was a trans-Atlantic passenger ship on the Hamburg-American line. She was built in 1882 by Reiherstiegwerft, Hamburg, Germany and was 350.1 feet long and 42.6 feet wide and weighed 3,467 tons. The steamship had a speed of 12 knots and was powered by compound engines that delivered 2000 I.H.P. to a single screw. The steel-hulled ship had three masts (the foremast rigged for sail), and one funnel. She had accommodations for 96 first class and 1100 third class passengers and a crew of 90. She was launched on November 23, 1882 and sailed from Hamburg on her maiden voyage to Havre and New York on April 4, 1883. On November 13, 1892, the Rhaetia left the port of Cuxhaven, Germany for the port of New York, a transatlantic crossing that took 15 days. Among those on board were Carl and Wilhelmine Maass and their ten children who were immigrating to the United States. The SS Rhaetia commenced her last voyage on this service on November 4, 1894 and in 1895 was taken by Harland & Wolff (shipbuilders) in part payment for the new ship PENNSYLVANIA. She was then bought by J. H. Bögel of Hamburg and in 1898 was sold to the US Navy and renamed CASSIUS. In 1900, she became a US army transport and was renamed SUMNER. On December 11, 1916 she was wrecked on Barnegat Shoals, NJ. 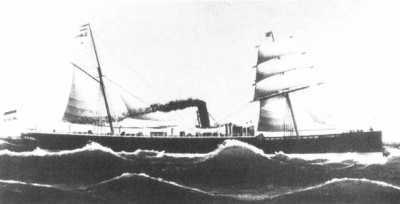 The SS Werra was built by John Elder & Co, Glasgow for Norddeutscher Lloyd and was launched on July 4,1882. The iron-hull ship was 433.1 ft in length, 45.9 ft in breadth and had a gross weight of 4,817 tons. She had two funnels, four masts, a single screw and traveled at a speed of 16 knots. The ship could accommodate125 first-class, 130 second-class and 1,000 third-class passengers. Her maiden voyage from Bremen to Southampton and New York began on October 12, 1882 . Two years later, Ludwig and Catharina Rudolf, together with their nine children, boarded the Werra and arrived in the Port of New York on October 18, 1884. After her last voyage on this route on November 9, 1891, the Werra was transferred to the Genoa - New York run. Between December1898 and the summer of 1899 she was chartered to Spain to repatriate Spanish troops from Cuba. On September 24,.1899 she began sailing from Bremen to Southampton, New York, Naples and Genoa. Following her final voyage between Genoa, Naples and New York, which began August 28,1901, she was scrapped. Source: Ted Finch who cited North Atlantic Seaway by N.R.P.Bonsor, vol.2, p.552. The SS Allemania sailed from Hamburg, Germany on March 19, 1882 bound for New York. The U. S. and German manifests indicate that she had a total burden of 1375 tons and carried 566 passengers. The ship arrived in New York 19 days later on April 7, 1882 with Captain Merstorff at the helm. Among the passengers were Heinrich and Johanna Lüdtke with their three children, Anna, Emilie, and Ida. They are listed as passengers numbered 410-414 on the U. S. manifest. Although Ida was listed as being 7 months old, she actually arrived in New York just two days before her first birthday. Heinrich and Johanna were leaving Zampelhagen, Pommern and were heading to the United States. The search for the passenger list for the Lüdtke family began in 1988 and finally was successful ten years later in January 1998 after an intensive 3-day search at the National Archives by Gene and Norma Maas. Over 325 passenger lists, most with 600 to 1000 passengers, were searched in those three days alone. Perhaps as many as 200 more lists were searched in 1988. We had been told that Ida was about six months old when she came with her parents, consequently we were searching passenger lists during the wrong time frame. After assuming that they wouldn't have traveled in the winter but rather in the spring, our persistence paid off. The U. S. manifest was found on microfilm no. M-237, roll 448 (ship listing #418) obtained from the National Archives in Washington, DC. Knowing the precise dates of the voyage made it easy to obtain the German manifest which was on microfilm no. 0472917 at the Family History Library, Salt Lake City, Utah. The Peter and Christine Meidinger family sailed from Bremen on March 24, 1903 aboard the SS Kaiser Wilhelm der Grosse and arrived at Ellis Island, New York on April 1, 1903. The US manifest shows that Peter, aged 50 and Christina 40 were traveling with their eight children, Katharina 19, Christina 14, Friedrich 12, Johann 10, Lidia Maria 4½, Elisabetha 3, Karolina 2, and Jacob 6 mo. They were also accompanied by Christina's mother, Barbara Gramm, a 74-yr-old widow. Their last residence was Kassel, Russia where Peter was a farmer. Surprisingly, he was traveling with $900, a substantial sum of money at that time. Peter paid for his familie's passage and Barbara paid for her own. Their final destination in America was noted as Lehr, ND. Column 15 asks whether they were going to join a relative, and if so, who. The first word of the notation here is undecipherable. However, the line for Barbara appears to say "friend". All indicated that they were in good health. The US manifest was obtained from the Ellis Island Foundation, Inc. The U. S. manifest for the SS Kätie is in poor condition, but fortunately, the entries for Wilhelm, Marie, Hermine and Carl Rieck are fairly legible. The port of embarkation was Stettin, Germany where in April 1882, William and Marie Rieck and their 7-month-old daughter, Hermine, boarded this steamship for their voyage to America. The 42-yr-old Carl Rieck, who accompanied them, is believed to be Wilhelm's uncle. The ship arrived at the Port of New York on May 8, 1882. The U.S. manifest can be found on Ancestry.com. The Julius and Emilie Maass family sailed from Bremen on May 16, 1895 aboard the SS Oldenburg and arrived in the Port of Baltimore on May 31, 1895. According to the U. S. manifest, their last residence was Braunsforth, Pommern and their destination was a brother in Minnesota Lake, MN. It lists Julius as 48 years old, Emilie 44 and that they were traveling with their six children, Bertha 20, Anna 18, Carl 16, August 8, Hedwig 7, and Frank 4. Actually, August was 9 and Frank was 5 years old at the time. The manifest shows that they were carrying $1050.00, a significant sum of money. Julius was listed as a laborer but he had been a shepherd in Braunsforth. The original German manifest prepared in Bremen no longer exists. Emigration records for the years prior to 1910 were destroyed by city archivists for lack of storage space. The U.S. manifest was obtained from the National Archives in Washington, DC. The German manifest shows that Christian Rieck and his three children, Albertine, Louise and Bertha were passengers 612 to 615 on the steamship Polynesia leaving Hamburg, Germany on 3 June 1883. They were leaving their home in Hohenselchow to join his son, Wilhelm, in Minnesota. On that date, their ages would have been 46, 12, 11 and 6, resp., not 45, 9, 7 and 5 as listed on the manifest. Caroline Müller (37) and her two children, Auguste (9) and Wilhelm (4), were passengers 564 to 566 on the same ship. Caroline, who was from Casekow, turned 38 during the trip to America. It isn't known if her children's ages are correct. The SS Polynesia sailed under the German flag with Capt. Kühn at the helm and arrived in the port of New York on June 22, 1883. I find it amusing that on the U.S. manifest, three of the children are listed as one year younger than when they left Hamburg. Since the passenger numbers of the two families were not contiguous on either manifest, one must assume that they boarded at different times. Nevertheless, we know Christian and Caroline were traveling together. They were married on July 3, just 11 days after arriving in the US. Both the U. S. and German passenger lists can be found on Ancestry.com. The U. S. manifest lists the port of embarkation as Cuxhaven, a port at the mouth of the Elbe river, about 100 km (60 mi) down river from Hamburg. The Rhaetia arrived at the port of New York on November 28, 1892. Carl, Wilhelmine and their family are listed as steerage-class passengers numbered 155 through 166. Unfortunately, the ink was smeared for some members of the family. The U.S. manifest shows that the family traveled amidship in section B on the maindeck and that they had two pieces of baggage. The U. S. passenger list was obtained from the National Archives, Washington, D. C.
These two passenger lists tend to refute the story related by Maass descendants that the ship that the family sailed on was never used again after arriving in the United States. Supposedly, as the story goes, the ship they were scheduled to board was delayed for repairs. Rather than waiting two weeks for it to sail, they took passage on a ship formerly used to transport cattle, a ship that had been converted to bring German and Polish emigrants to the United States. This same story was told about the ship the Julius Maass family sailed on, which wasn't correct either.